Found this via Design Mom. Love, LOVE! 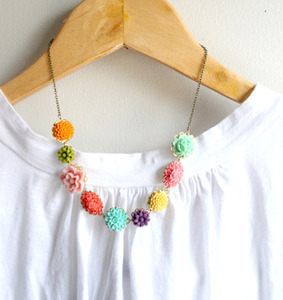 So colorful and perfect for Spring. I have a feeling all my money will go to diapers in a matter of days, so maybe I deserve a little treat today? lOve too, so cheerful, I'll go check it out, thanks! What a cute cute necklace! Love it! The nursery - Completed! - Part ONE~!